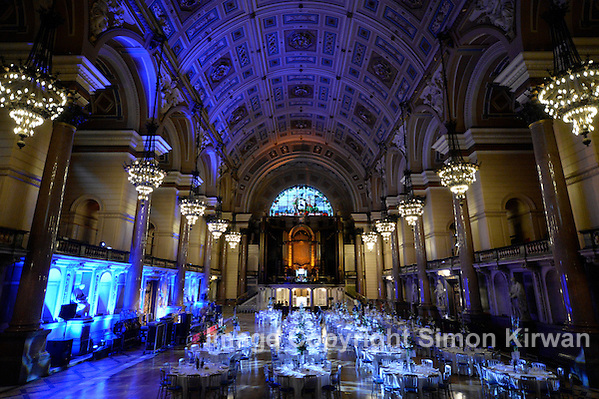 St George’s Hall Liverpool Evening Event Set-Up – Photo By Simon Kirwan. St Georges Hall Liverpool is a Grade 1 Listed Building, designed by Harvey Lonsdale Elmes, after his death in 1847 work was continued by John Weightman, Corporation Surveyor, and Robert Rawlinson, structural engineer, until in 1851 Sir Charles Cockerell was appointed architect. Cockerell was largely responsible for the decoration of the interiors. Major restoration of the hall took place in the 2000s. St George’s Hall is regarded as one of the finest examples of Neo-Classical architecture in the world. This entry was posted on Friday, September 20th, 2013 at 9:57 am. It is filed under Event Photography, News and tagged with Charles Cockerell, conference, convention, Event Photography, event photography, Harvey Lonsdale Elmes, John Weightman, Liverpool, Liverpool photographer, photographer, photography, Robert Rawlinson, Simon Kirwan, St George's Hall. You can follow any responses to this entry through the RSS 2.0 feed.